The system should now playback the IP Address your device has been assigned. Using your favorite web browser from a computer on the same network, point the address to the IP address of your adapter. (example http://192.168.1.2) Replace 192.168.1.2 by the IP Address your device is currently using. You should now see the web interface of your Linksys/Sipura. At the top of the page below the tabs, click on the link "Admin", and once the page has reloaded, click again on the link "Advanced View". You can configure your adapter with a better dial plan, allowing faster dialing of 10 digits number (Local US/Canada) and also enable 7 digits dialing in one area code of your choice. 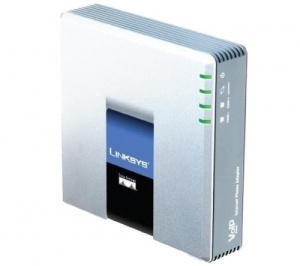 Read the article called: Configure your Linksys VoIP ATA the right way! To upgrade a firmware version from a Windows system, the PAP2T-NA documentation nor Cisco's web site does not say how to do this. Go to Cisco PAP2T Internet Phone Adapter with 2 VoIP Ports. Click on the link "Download Firmware", which downloads the .zip file. Run the .exe file, then enter the IP number of the ATA device (called “SPA” in the program). It then upgrades the device. This is provided for your information: the author is not saying you have to upgrade the firmware. Note: However before changing that option, test if calling the number with an # at the end of the number works(e.g. 5554441234#). If that doesn't work you need to contact IBNtel customer support. 1- First access the PAP2T's web interface. 3- Click on the Regional tab and look for the Control Timer Values (sec) section. 4- Enter the desire value in the Interdigit Long Timer field (for example lower this value to 4). Sometimes the Phone you are using is designed for a certain Voltage and Ring Waveform. If someone tries to call you and the phone appears to be ringing for the caller but your phone never rings please follow these steps to hopefully resolve this issue for you. Step 1: First access the PAP2's web interface. Please look under the Voice>> Line 1 page in your Linksys device for the following setting: Restrict Source IP and make sure it's enabled. Sometimes it will be very helpful to reset your linksys ATA adapter to factory default settings. Connect a telephone to line 1 of the PAP2T unit and power it on. Disconnect your PAP2T adapter from the internet connection(unplug the Ethernet cable from the PAP2T hardware unit). Resetting with internet connection may mess up the unit making it completely useless. Dial ****, and wait for the Interactive Voice Menu (IVM) to get activated. Type in the following number including the # symbol. Confirm this by pressing 1. Your linksys ATA unit will now go back to it factory default settings. Note: There are some PAP2/PAP2T devices in circulation which were originally 'locked' to one provider and subsequently unlocked by end users. Do *not* use the RESET$ command with these boxes.